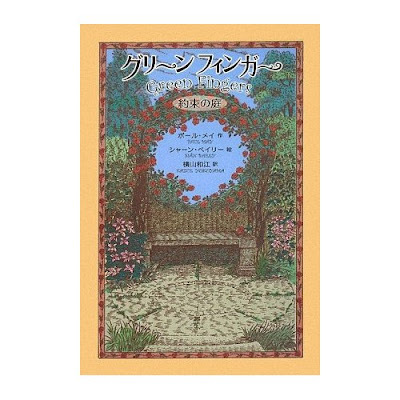 I noticed that the new Japanese edition of Green Fingers had attracted a five star review on Amazon,jp. (That's how sad authors are! Well, this one anyway.) So I translated it with Babelfish and out came this bizarre poetry. I think they understood what I was trying to do, and I was impressed that they noticed, as no other reviewer has done, that there are oblique references to 'The Secret Garden' of Frances Hodgson Burnett. Among 5.0 five stars the garden which revives it brings, the story “of miracle”, 2009/7/2 By The free person east - you look at the review entirely Being delicate, the cover of the color tone which settles. The cutting picture which is used in you taste and are deep is. Thing “of the person who are skillful “the green finger” of title, according to the postscript of the translator to raise the plant,” it seems. If you mention “the garden”, “Hanazono of Burnett secret” and so on is famous, but the contents that your this story are the same the children and the old person recover the smiling face by the fact that “the garden” is loved. Simply, today there being just a work as expected, with ordinary means it does not go. The child who suffers from study obstacle. Sorrow of the old person who loses the destination. The parents and the heart which face to the catastrophe trouble of the children who can hurt…. The kind of part which even pathology of today's society is said being portrayed, rather harsh development continues. As for main characters elementary school student rank? Girl Kate, that younger brother microphone, and young younger sister [emiri]. Grandfather Walter of [ruizu] and [ruizu] of the friend of Kate's parents and Kate… with the place where you say. In the wind that, is conclusion of the “happy end”, “the garden which is lost” revives from interchange of the children and Walter, is released even from the suffering of each one, but as the word that “it changes “everyone… it cannot go backward the person””, displayed, “as for future thing you do not understand”, that you say, also circumstances of the children who keep accepting “actuality” keep being drawn,…. As a child book when “the conventional” story is expected, perhaps, surface saddle [u] one you are, but the spectacle of the garden which little by little displays the form and the smiling face of the children are attractive. Kate's age not to be written, because it is left to the imagination of the person who is read, remembering the familiar children, it is good reading, probably will be. It touched the everyday earth, the grass flower while passing the time of the [ru] with love, it was similar to old person Walter, the beautiful garden where the girl Kate's who keeps becoming the “green finger” story, it revived brings, importance of the thing which stands up with the foot of the self without escaping from harsh actuality through “miracle”, is made to realize. In very the children who are devoted to study and the game the story which would like to have reading. Of course, even in the adult who finishes to become tired with work and play recommendation.